Shugendo is the Japanese syncretic tradition first originated in pre-Feudal Japan. The word Shugendo is interpreted as the “way” to learn and master magic and ascetic power. The whole philosophy of this religion in perceived through the relations between the man and nature in ascetic mountains. Shugendo is the technique of perception and practice developing spiritual power and experience. 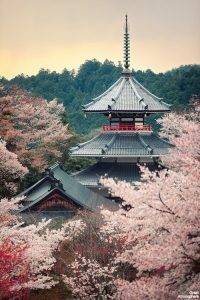 As the religion, Shugendo appeared in the 7th century as the compromising balance based upon mystical-spiritual habits incorporating concepts adopted from Old Shinto, folk animism developed as Buddhism and Taoism. En No Gyoja or En the “ascetic” is the father of Shugendo. Also he is known as En no Ozunu (or Ozuno), En no Shōkaku and En no Ubasoku. He is said to be a perfect master of many magical arts. Kimpusen-ji in Yoshino is the head temple where Shugendo is centered. Yamabushi is the word to stand for “a person who lies in the mountains”. Yamabushi have often been attributed the properties of a supernatural characters of Japanese myths and legends with special properties. Shugendo path is very hard, including approaches that are very treacherous. These include scrabbling without being safeguarded, taking shower under the freezing waterfall, meditation at the steep edge and approaches involving fire and a lot more. There was no reference literature on how and where to practice such approaches and no one could have written them. There was only the relation between the teacher and the apprentice to deliver the knowledge to seek for the balance between life and death. These approaches and techniques make a person insusceptible to cold and heat; they teach to be tolerant and patient, make the will stronger, provoke reserve forces of humans, help to reveal extrasensory abilities and commit to make a person sturdy and venturous. All the above mentioned capacities are extremely important for the Ninja warriors. The system of Ninja trainings includes many of Shugendo practices.